I recently returned from a target trip to Panama and wanted to share a couple of sightings we had during our time there. The group consisted of myself, Harry Barnard, Jason Horn and Macklin Smith. 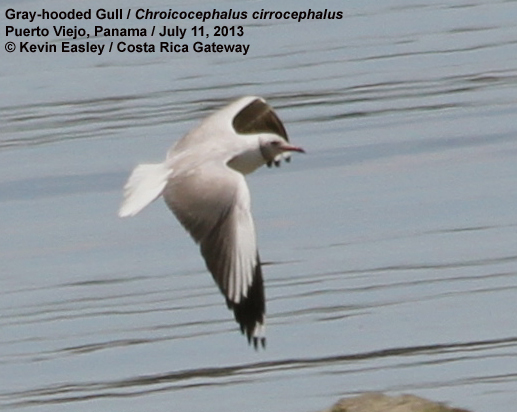 Harry, Jason and myself arrived fairly early to Panama City from Costa Rica on June 30 and decided to see if there were any rarities hanging around [Panamá] Viejo, before Macklin arrived. After an hour of scanning with birds being very distant due to low tied we had a late breakfast and then returned to find the tide was now coming in, bringing birds with it. 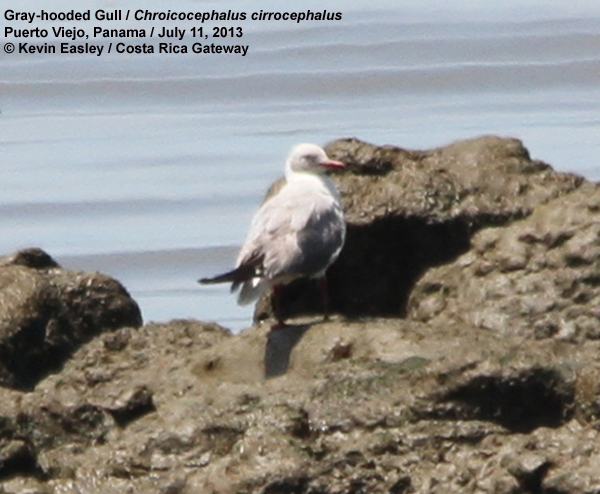 Amongst the Laughing Gulls and one breeding plumage Franklin's Gull (which didn't make it north) we found a gorgeous Gray-hooded Gull. I had read on Xenornis that one was seen in July of 2012. I was able to get a few definitive photos of this vagrant. A nice start to the trip to say the least. Macklin had seen the one in Coney Island so he had it on his North American list already. Our next surprise came the last full day in Panama, July 11, 2013. While waiting out the rain near the town of Chepo we decided to drive the side roads through the wet farmland. We came upon a Bare-throated Tiger-Heron followed by three beautifully plumaged Capped Herons. Further along I noticed a heron in the top of a tree. It wasn't very close but even without bins it looked odd and I remarked that it looked like a Whistling Heron. Jason got his bins on it and shouted out "IT IS!" We got out in the rain and scoped it getting excellent views for about 15 minutes before it flew away... back and to the right. The photos are not excellent but with such a unique heron it is easily identifiable. I also took video which looks good on a big screen. 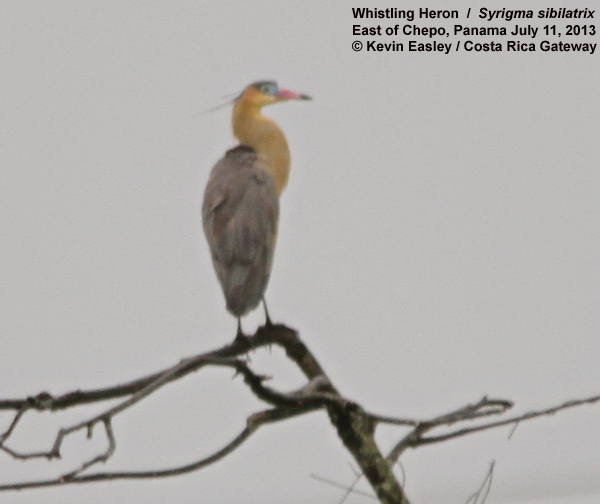 Whether this is the first documented record of Whistling Heron in Central America I cannot say. There is a rumor that a group which included a guide from Costa Rica saw and photographed one while on a boat trip in Panama... that is ALL of the information I have on that unfortunately. If anyone has any more information on this I would be interested in reading about it. 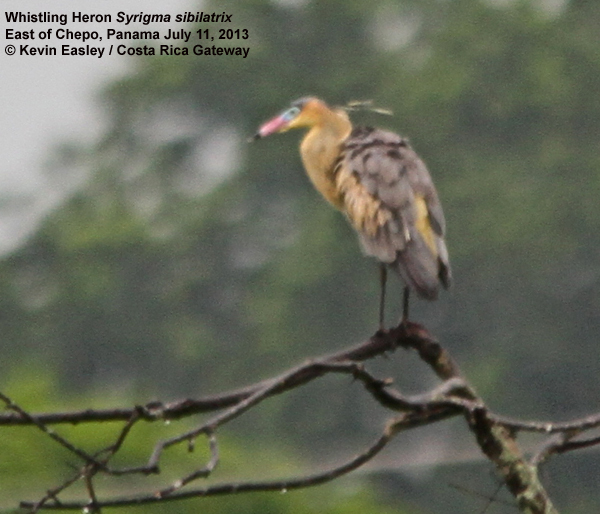 Whistling Heron is found in South America, east of the Andes. It is not uncommon in the Orinocan River basin including the Llanos of Venezuela and that is where I first saw it on a trip with my Dad back in June of 1986. It is also found in the wetlands of Eastern Bolivia, the Pantanal and many other suitable locations down that way. There are reports of seasonal movements of individuals of the Llanos population moving to the Northeast part of Venezuela. Perhaps this is one of those individuals that kept moving east. I related this information to Bill and Claudia Ahrens when I visited them at their house on Cerro Azul that very Thursday evening. Bill wrote me back on Friday saying they had gone down to the area but were unable to relocate the Whistling Heron. Directions to the site: As you travel east on the Pan American Highway from Panama City, or Tocumen, you will come to a Police Checkpoint just before the town of Chepo. Right before this checkpoint you take the road to the left which passes by the Police Headquarters (on your right). This road is initially paved but goes to dirt very soon. At 2.2 kms after that left turn you will see an assortment of buildings on your right, all with blue roofs...they do stand out. Go another .6 kms (now 2.8 kms from the left you made just before the Police Checkpoint), and the bird was on the right side of the road on top of a tree overlooking a marshy area. The bird could be anywhere in that area and it is a fairly vast area to cover but it might be worth your effort.